Game description: Players dance, sing and create music videos with this videogame party package that takes advantage of the innovative controls getting gamers off their couch and playing to a new beat. Not only do gamer belt out their favorite tunes or dancing to the latest hit songs, players catch their best dance moves, record their own voice and make music videos with the easy-to-use music video creator. 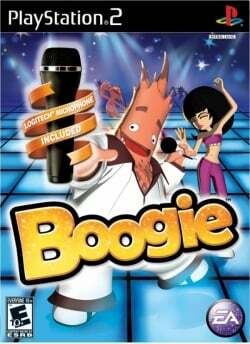 Fun mini-games, co-op gameplay, head-to-head dance battles and karaoke party make Boogie a complete entertainment package for gamers of all ages. Gsdx and ZeroGS both crash very shortly after running game. Zzogl gets intro screens (although completely broken) and menu, which is also broken. USA v02.20(10/02/2006), Standard hacks, Gsdx and Zero gs shown for us the same result., Strangers colors in the intro and firsts menus with glitches,in game the game would be the normal if it were not for a blink in the screen 3 seconds by 3 seconds.For theses disturbings you no go finish the game. USA v02.20(10/02/2006), Standard hacks, Gsdx and Zero gs shown for us the same result., Strangers colors in the intro and firsts menus with glitches,The game still if Blikings(Blink),this dirturb the gameplay experience. This page was last edited on 23 December 2016, at 19:25.